Where we once belonged / Sia Figiel. - Auckland (New Zealand) : Pasifika press, 1996. - 235 p. ; 22 cm. ❙ Née à Apia, aux îles Samoa, en 1967, écrivain, peintre et véritable actrice quand elle présente ses poèmes, Sia Figiel est considérée comme une des très grandes voix du Pacifique. DESCRIPTION : Alofa Filiga is thirteen years old. She lives with her family, the Filiga'aiga, in the village of Malaefou, not far from Apia in Western Samoa. 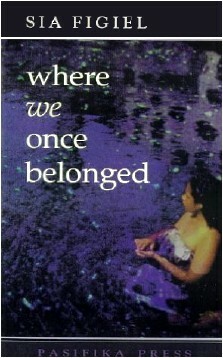 But Alofa isn't happy; coming of age in Samoa isn't as easy as those European anthropologists imagined it to be. Sia Figiel's first book uses the traditional Samoan storytelling form of su'ifefiloi to tell a modern tragicomedy of violence, the repression of women and the struggle for identity in today's Samoa. It is a forceful and honest adult work; the first of its kind to come from the Pacific.